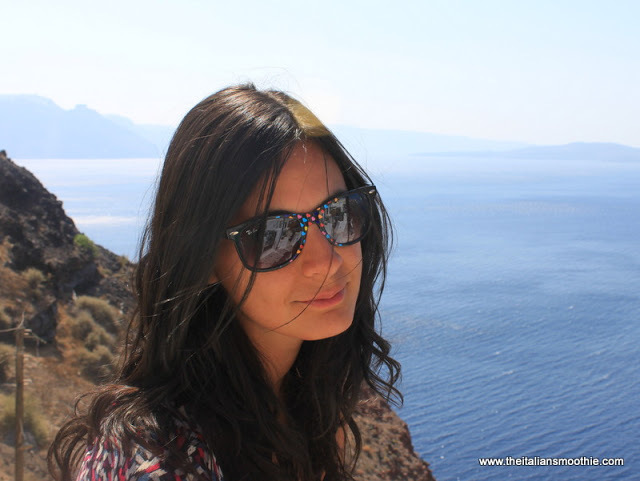 If you are planning a visit to Santorini this list is what you need to organize your trip in the best way, travel with me along the best thing to do in this amazing island. It may seem strange to elect the first visit to this winery that is also an art space but I assure you, it was one of the most enjoyable and unexpected visits of my holiday in Santorini. Upon my arrival, a beautiful white farmhouse in line with the greek style greets me with dozens of flowers and plants, the holder using a funny English receive each guest in person while the daughter runs the bar counter of the tasting and sale the bottles they produce (so good). The tour is very interesting visiting the new tanker, the raki distillery and the production of this grappa in the old way which produces one of raki labels more popular of the island, the old stables, the old part of the property and the new cellar where the wine is produced and bottled. 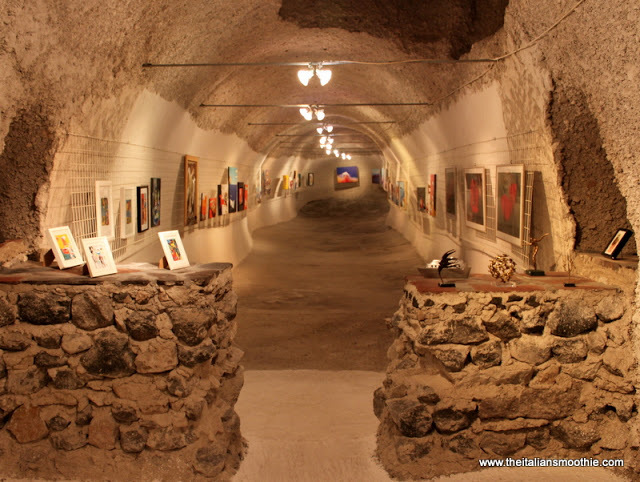 Finally you have the chance to enter the part of the exhibition gallery, housed in the spaces of the old wine cellar where the wine was produced until 1952 and where now are exhibited paintings and works of art even at 5 zeros. The visit is totally free, I recommend in the late afternoon so you can finish the tour with wine tasting (excellent) and buy a few bottles to enjoy during your holiday. Do not miss the thrill of taking the plunge into the sea from hundreds of rocks scattered around the island! In Santorini it is really hot so do not bother trying to enter slowly into the water, look around, find the most high rock and launch! It’s just incredible and stirring jump in to this blue wonderful sight, the nature up and under the water is astonishing, trust me you will never came back from this island, ah! and do not forget the plastic shoes to be used in water, essential! 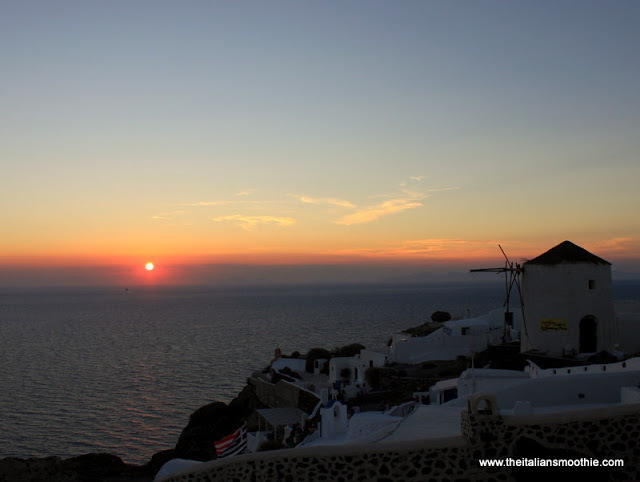 I doubt very much that someone decides to leave for Santorini with a group of rowdy friends, is much more likely you are to face a romantic week at two and maybe you’re wondering where to stay: well, I RECOMMEND AT 100% THE VILLAGE OF OIA. 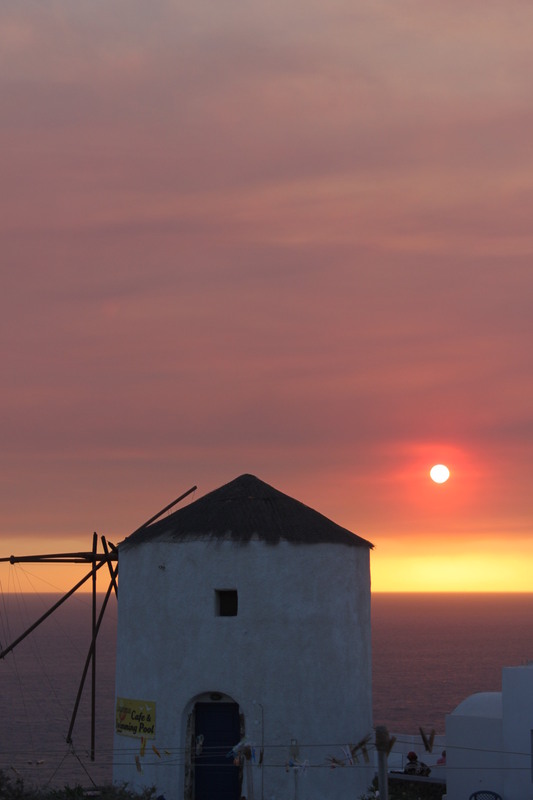 Oia is the most west city of the island, just in front of the crater of the volcano with the most beautiful sunset of the world. Every night thousands of people flock to this part of the island, they cling every inch available, waiting for the fall of the sun and ready to applaud one of the natural wonders most beautiful ever. Book a room in Oia was the best decision ever, in the morning the view is breathtaking, I can’t describe the happiness to open the windows of my lovely totally white mini apartment excavated in the rock and sea kilometers of blue in front of you, making breakfast in this paradise or in the evening waiting the most incredible sunset of the world cosily sat in my terrace whit a glass of white wine. Dreamily! It was one of the most ‘beautiful moments of my life. 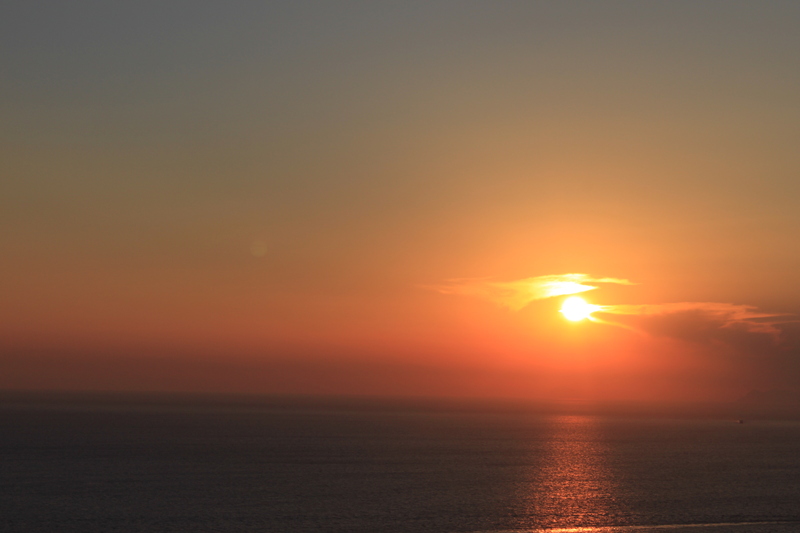 If the sunset from Oia is gorgeous even from the lighthouse the view not joke at all. Located completely to the south of the island of Santorini, the lighthouse stands on a tip of giant rocks overlooking the sea. Not recommended if you suffer from vertigo but perfect if you love the views and endless blue. 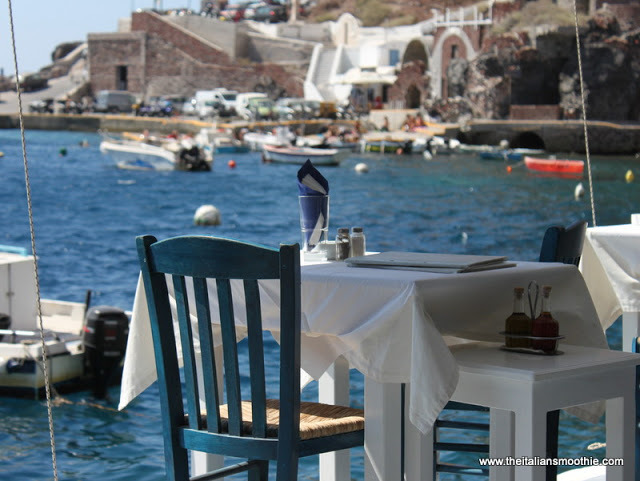 Whether lunch or dinner, doesn’t matter, the little harbor of “Amoudi” is pure love always. 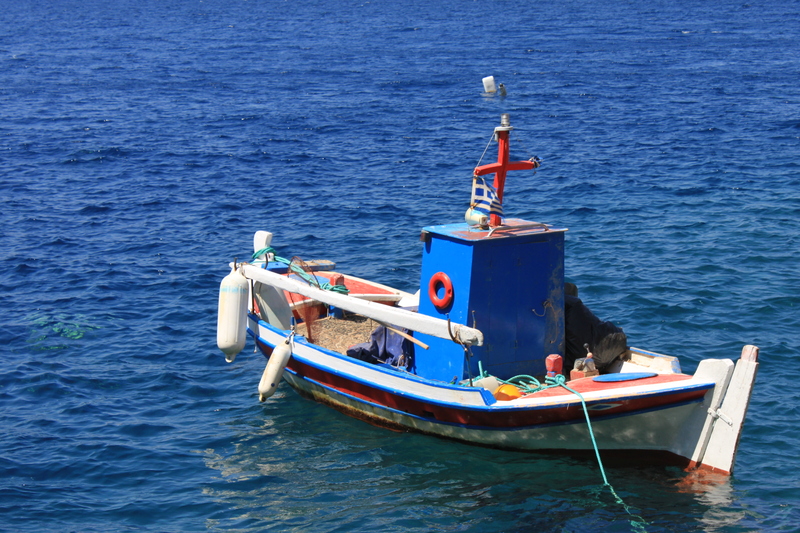 Located under Oia in a little gulf surround of lava and pumice stones, the fishing harbor is perfect if you love fresh fish. Here large grills on sight are used to cook the fish catch during the day. Just freshness and quality, and with a unique view. The place is very famous, so if you arrive late the tail is assured but deserved wait for a charming spot like this. 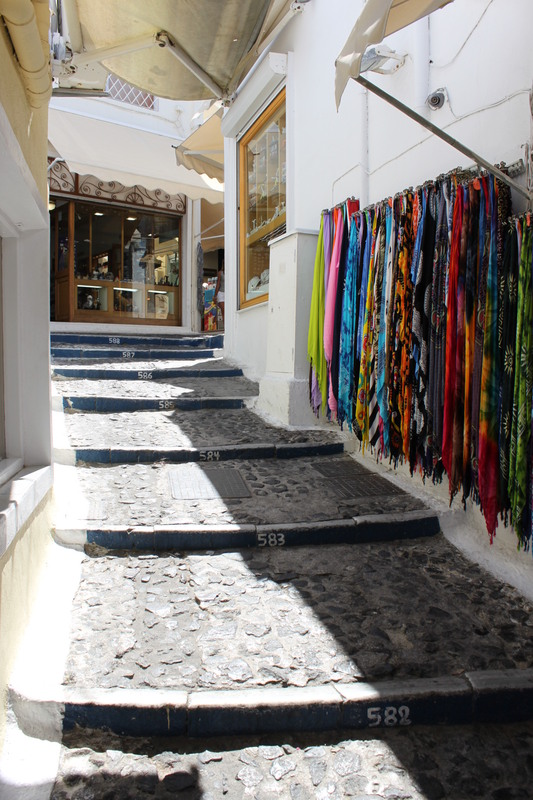 Wandering Santorini you will surely realize how many small shops fill the island. Although the style in general is quite expensive don’t think that all products for sale they are, if you look hard enough you will see that there are many shops with unique and original handmade jewelry at normal prices. Do not be scared and good hunting! Under the Oia mills there is a wonderful pool with a breathtaking 360° view. 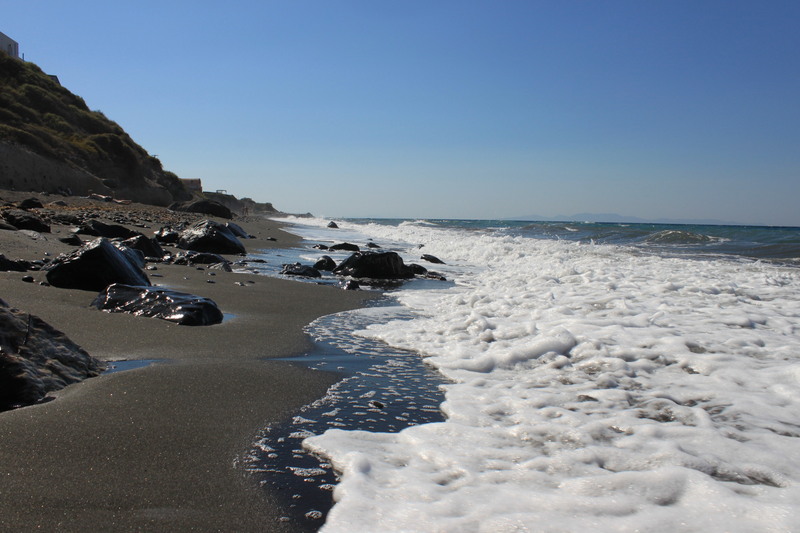 In Santorini it is very hot, and the rocks are not always so comfortable so if you have the opportunity of a relaxing day in the pool why not take advantage? Admission is free, just take a drink at the bar and deck chairs and umbrella are included. 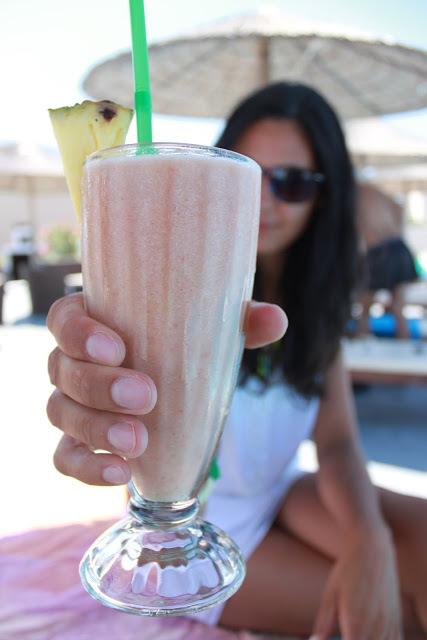 Prices are average, fresh fruit smoothies and burgers are delicious and is all served under the umbrella, TOP! 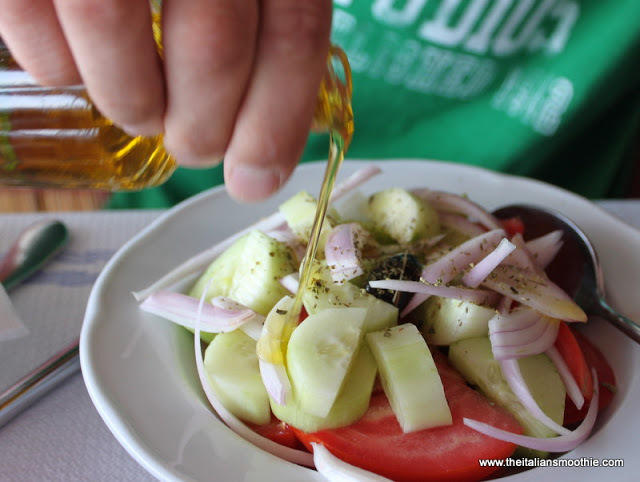 If you are looking for a real Greek experience in Santorini I suggest a dinner at the restaurant “Santorini Mou”. Here every evening the owner and his friends after few drinks are use to sing typical Greek songs and serenades involving all diners. Dance, guitars, great atmosphere, raki and wine. 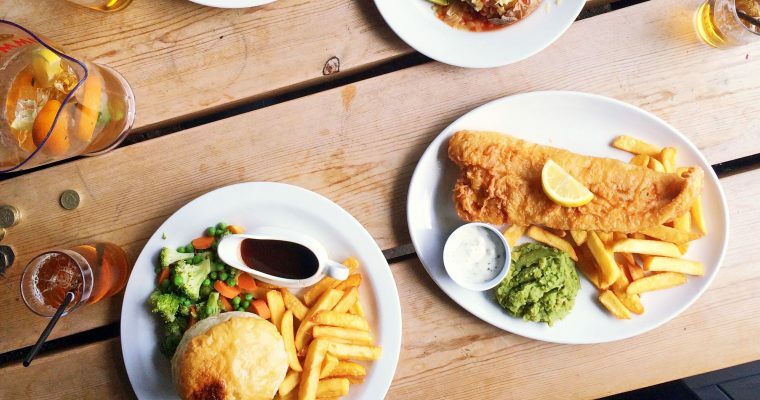 The food is good and the fun is guaranteed. 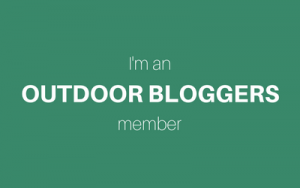 Trekking are one of my passions and this trail is a really nice walk to do early morning or late afternoon. The view is particular, different from Oia or Akrotiri. You have the view of the entire crater, Kameni and Manolas Island. Bring a lot of water, a sandwich and the camera with you, the panorama is guaranteed. 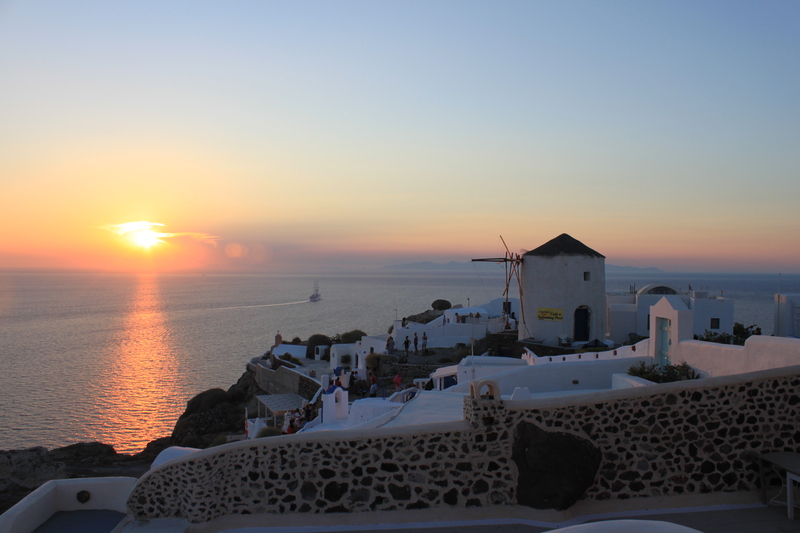 There are plenty of tours to do in Santorini. All the tour operators turn the island with the various proposals,they organize the whole day. We had the most complete tour, from the morning into the night. We took a sailing ship from the old port with others 50 people, we share the table with another couple so become friends was fast and the trip was more fun. The tour included the tour of Kameni the island in the middle of the Volcano, a bath in the sulphurous waters, a bath in the crater, lunch, lots of dips, a nice boat ride and fireworks fired from the crater that created a play of light and fire in order to create a fake erupting, gorgeous! A week in Santorini fly, for me although a bit ‘more’ expensive than other Greek island I entered the heart and I always hope to be back sooner or later. 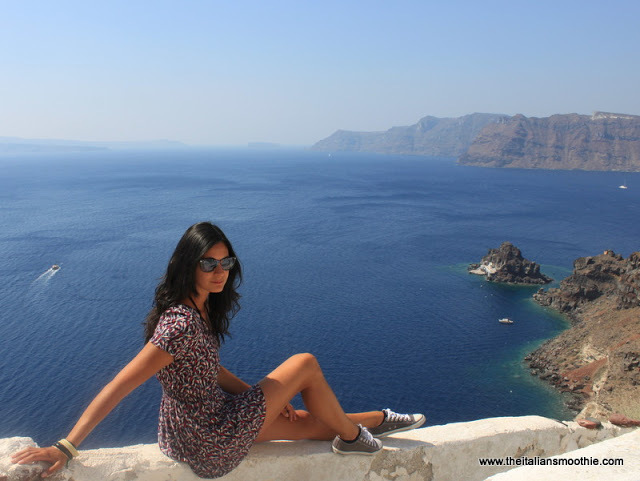 You can not say that I saw a breathtaking view if you have not been to Santorini at least once. I really loved this location, rooms are beautiful, white caves with the best view ever with private terrace included. Really recommended! 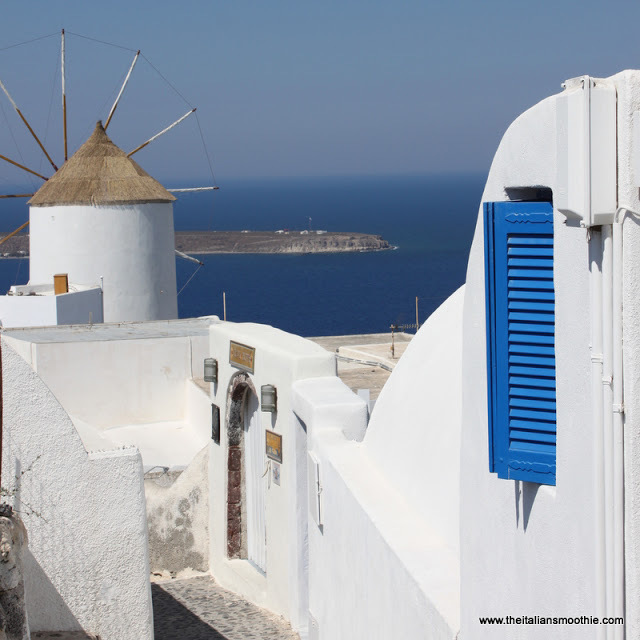 Melenio (Center Oia 84702 ) – Do u like cakes? 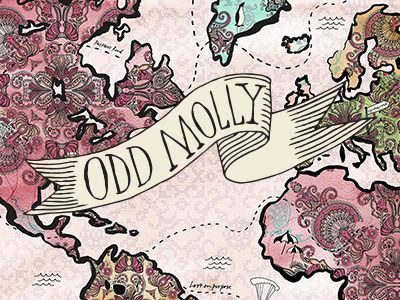 So Melanie is the place you can’t miss. Cake and panorama are the top of the whole island. 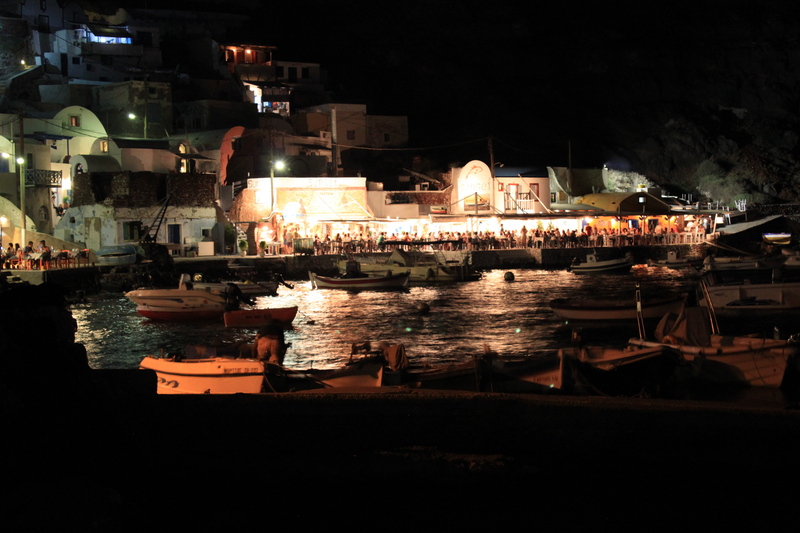 Ammoudi port – Grilled fish is awesome and the gulf in the evening is a dream. 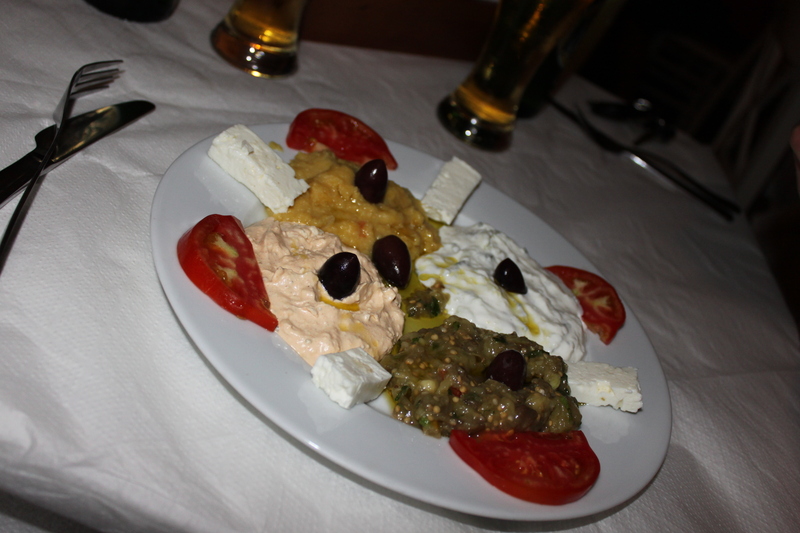 Naoussa, Fira – I really loved the “kafteri piperja” a delicious spicy peppers, good prices and good food. The shoes for the rocks are essential. Rent a scooter, both quads that machines are impossible to park. Bring your driver’s license and identity card, without there renting is impossible. Double check the prices before you sit down at the restaurant, is not an economic island. WEEKEND IN PUERTO ESCONDIDO? BIENVENIDO!